One of the great things about being an expert is that you don't have to look things up in the manual or the recipe book every time you want to thread the sewing machine or cook a tasty meal. Another example, shared by most people, is the ability to drive: you do it more or less automatically: you don't have to think every movement through. On the other hand, the drawback of being an expert is that you're not necessarily thinking it all through. How many of us would pass a driving test tomorrow if we didn't brush up on the protocols and standards of correct driving? The problem also for experts is that a) they sometimes don't remember or grasp what the non-expert won't understand, and b) they rely a lot on memory, and sometimes their encyclopaedic memory lets them down. 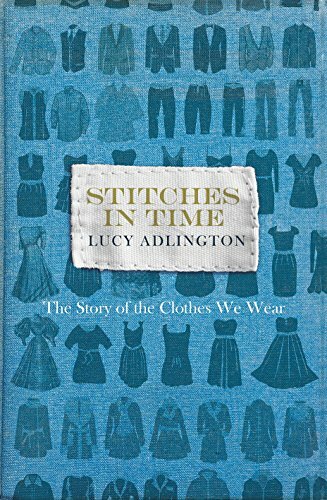 I mention all this because I've been enjoying Stitches In Time, the 2015 book by Lucy Adlington about costume history. It is a brisk read, and the author has a good succinct style that whisks you from one 'data point' to another in a remarkably smooth fashion (so to speak). It should be noted that 'costume' isn't just 'fancy dress': costume is any clothing worn at any period. What you are wearing right now is a form of costume of the early 21st century. Yes, dear reader, you are a historical actor even though you are living right now! A few times in this enjoyable survey of various parts of dress -- underwear of all kinds, dresses, suits, trousers, and so forth -- I've been brought up short by a questionable presentation that I feel only an expert such as Ms Adlington would give us. For instance, in the first chapter we are told: 'Children might even be sewn into their underwear over winter, purportedly to protect them from chest infections' (p. 12). One wonders what that could possibly mean. It raises a gruesome image of needles weaving in and out of flesh. Probably it simply means that underwear was sewn on tightly once the child was dressed in it, so that he or she couldn't remove it without a pair of scissors or seam-rippers. For readers unfamiliar with such a practice, it might have been helpful to state this. To an expert: an obvious fact; to a non-expert, something that had to be thought about. Then there is the explanation of the origin of the word 'crinoline'. Because experts know things, they sometimes don't realize what they forget and what needs checking on (this is where the editor ought to be doing his or her job). Every source I have checked, including my various dictionaries, agree that the word has two parts which both derive ultimately from Latin -- via French and Italian: 'crino' (Latin 'crinis') meaning horsehair, and 'lino' meaning flax and therefore linen. Adlington, by contrast, tells us that 'crinoline' is a 'distortion'* of French words, the second part coming from 'laine', which is French for 'wool' (p. 124). It's a completely plausible explanation, as crinoline was often made with wool in the weave, and horsehair was eventually dropped -- but plausible as it is, no one else mentions wool. The 'line' part refers to flax. So the question now is whether Adlington knows this etymology and disagrees with it, as a scholar of the subject, or whether (as seems more likely), she is such an expert that she declined to look it up, and has therefore passed on an error. We are also told that crinoline steel cages -- the understorey infrastructure of a bell-shaped skirt -- could be collapsed by the wearer even while she was wearing it. This again is hard to imagine unless you've actually seen one. Apparently it could be removed and hung up on hooks while a lady took public transport: again, hard to imagine. For one thing, were there private crinoline-quashing booths where her under-supports could be removed? It all sounds so impractical. This is why more illustrations would have been useful, even though the book has many of them (mainly line drawings, with some black-and-white photos sprinkled throughout, and a central section of colour plates). Some things need to be seen to be really understood. Returning to underwear, and in particular, women's knickers: we remain in the dark after reading this chapter about what women's 'split drawers' were actually meant to do. After much mention of 'prudery', we never do come to learn how women with gussetless and indeed wide-open underpants actually dealt with the facts of a woman's existence. Presumably -- though this is not suggested by the author -- women used disposable wads or even something resembling a gusseted thong, which they wore between the drawers and replaced on a daily basis. But that's just supposition to account for the obvious fact that drawers without a contact point in the middle don't actually seem to protect anything. Perhaps the drawers were meant to be a further barrier to the basic central fabric that really did the business -- to hide in yet more layers the brutish facts of human biology. But then you would expect that the drawers, in performing this function, if they did it at all well, would sometimes have caught stains themselves. Which, apart from their basic and intimate nature, explains why so few drawers have come down to us. *'Distortion' is a word that Adlington uses often for terms that I would instead call an anglicization, as with Spanish 'veruga' transformed into 'farthingale', an Elizabeth hooped skirt.